A McDonald's in Bury have refused to serve man who showed up to their drive-in on a horse. A huge row broke out between a McDonald's drive through staff member, and a man on a horse after the horseman insisted he should be served, despite the fact he was riding a horse and not driving a car. "A horse is like a car to me, so why are you not serving me?" The incident, which Horseman Connor John Hamer uploaded to Facebook. Does a horse know how to queue? McDonald's staff members told the customer that it was "dangerous" to serve him, after he showed up on a horse towing a cart and tried to order a Happy Meal, citing health and safety of the horse and customers. Connor asked the McDonald's staff to point out the place in the McDonald's Drive Through rulebook which bans horses and carts, telling them "My horse has more right to be here than any of these cars." "How does a horse know how to wait in a queue?" It's unclear from their inflection whether this question was rhetorical, some kind of a riddle, or a genuinely earnest question about horse minds. A manager then came out and said that "due to health and safety reasons we are unable to serve horses in the drive through", and threatened to ring the police after Connor refused to move. The pair then spent a few minutes arguing with the staff for refusing to serve him, whilst his companions got served on foot in the non-drive-through section around the corner. The man accused the staff of being racist against gypsies in the four minutes of uncomfortable footage, whilst a second (unknown) woman told Connor she's heard of other customers who were allowed to buy McDonald's in store with a horse in tow. Double standards? 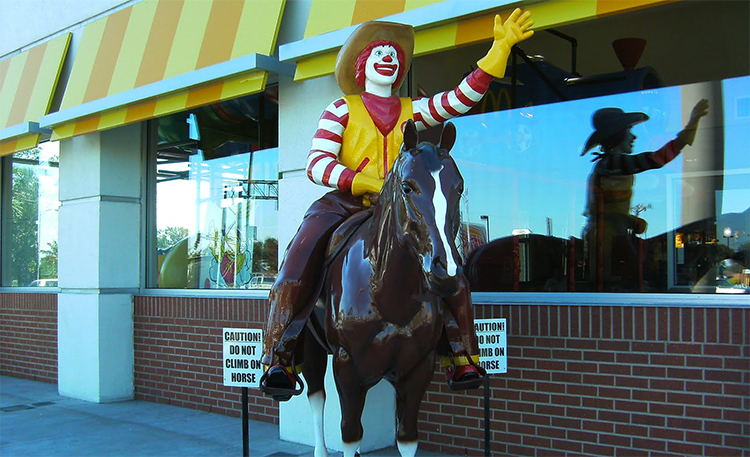 Ronald McDonald gets to ride his horse. "Not suitable for pedestrians, bikes or horse-drawn carts"
"This incident caused distress and disruption to our staff and customers," a spokesperson told the told the Manchester Evening News. "Our drive-thru lanes are specifically designed for roadworthy motor vehicles only and are therefore not suitable for pedestrians, bike riders, horses or horse-drawn carts." "Our staff member followed the correct procedure and the individual’s companions had already been served in-store prior to this incident." Connor accused the chain of being discriminatory against gypsies. 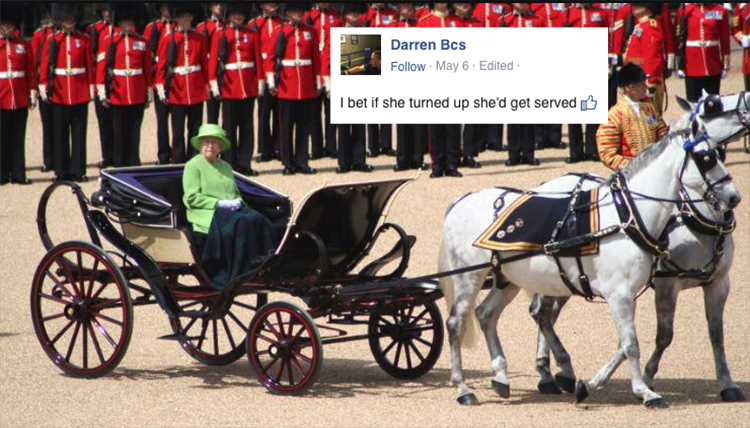 Other commenters on the Facebook video agreed, asking if the Queen would get the same treatment if she showed up on her horses.